Is there a tool to find the $2/day rates? Is there a website that allows you to find the cheapest cheapest rates for rental cars? I'm curious in which city and which days these $2/day, $3/day, $4/day rates hide. I was thinking of something like skyscanner but for rental car that allows you to see the price for each day in a selected month. Any tool to find car rentals "error fares"? Unlike airfares, car rental rates are not published in any sort of central database. The only way to find a price is to submit a query to the booking system for a given location, date, and time. And since changing any of those variables, even by 1 minute, can drastically affect the quote you get, it's not easy--or possible, really--to assemble any sort of database: it would involve running literally millions of queries to get all of the data and then re-running them all a few hours later in case anything has changed. Since a query through Sabre costs more than a cent, you can understand how financially infeasible this is, and if you were to try to scrape the data from the rental companies' websites, they'd surely notice all the traffic and block you. And to be honest, the target market for this is effectively zero. We've experimented in the past with sharing some of our better deal finds (rates in the single digits) on Facebook and Twitter and they went nowhere--no engagement, no interest, etc. Turns out people just don't plan their vacations around cheap rental car prices. They book their airfares first, hotels second, and then come running to us a couple of weeks before their trip freaking out that they forgot to book their rental car and now rates are sky-high and they need some help finding something that won't drive them to bankruptcy. m907, lougord99, trooper and 3 others like this. Autoslash explained the theory well !! emilio911 and AutoSlash like this. I was just asking because I received this email from Travelocity a few days ago. When I clicked the links, it truly gave the rates as advertised, I was really surprised it wasn't some sort of "from $2/day" thing. Note that we also now offer our own direct-book Slash Deals (i.e. NOT booked through Priceline). These special deals require payment at the time of booking, but can be cancelled up to 48 hours prior to pickup without penalty, unlike Priceline's own prepaid rates. In many cases, they are far lower than similar pay-at-counter deals (example). AutoSlash is a small company of less than 10 people. We have always been independent and plan to remain that way for the foreseeable future. Our goal is simply to get folks the lowest possible rate. Anyone who tells you otherwise is mistaken. cblaisd and cestmoi123 like this. There are certainly advantages of applying discount+code simply on "Direct Rental Co site". Why "directing" renter to any OTA?? 1. It's difficult, if not impossible, to do a deep-link search where a user can click through with discount code and/or coupon code embedded in the search link and be taken directly to the search results page. 3. Even when using the same discount and/or coupon code, prices don't always line up between sites. We can ensure that the prices we quote are the prices the user sees by using the same source for booking and searching. 4. For off-airport rentals, it's very difficult to do a deep-link search directly on a rental company website. Sometimes town names are spelled differently or are not recognized, and international off-airport is a complete disaster trying to build for. It took us months just to get the formats correct for the OTAs. 5. The rental companies aren't interested in partnering with us for affiliate commissions for obvious reasons. We need to pay our (small) staff and for hosting fees. Priceline is happy for us to send them a large volume of business. The small commission we make on each rental helps keep the lights on around here and continue to find out customers the best deals possible--and it doesn't cost you a thing. emilio911, IAHtraveler, cestmoi123 and 1 others like this. no need to receive advertising email. Go hotwire.com anytime, plug in destination/dates and get similar deals. I've seen $1/day summer FL - but of course airports add up to $7/day airport fees + %taxes. Expedia also owns Orbitz and Carrentals.com. 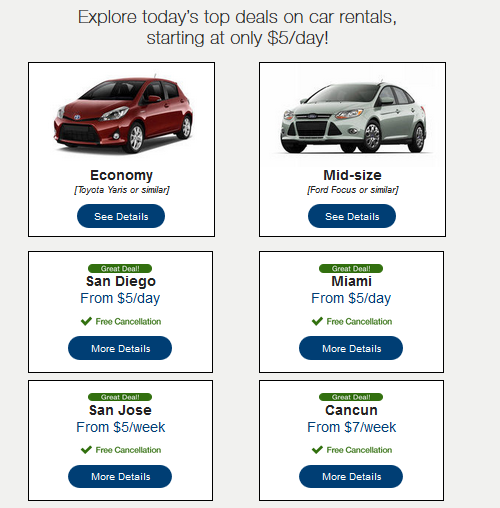 Priceline also owns Rentalcars.com and Airportrentalcars.com (among others). It's an incestuous industry. Crazy that they keep all the different brands functioning! I understand they tend to each focus on different markets (Avis/Enterprise/Hertz are business oriented while the others focus on the vacation/"budget" travelers, generally speaking), but the price to keep each open must be significant! I would love to snag a single-digit rental at a local airport and drive a nice rental car around for a weekend but I guess I'm in the minority. But would you fly halfway across the country to do it? If you have to spend $300 in airfare fly to the airport where rates are $2/day, then it sort of negates the savings. I think that's the point folks are trying to make. A super-low rate is only good if it's where you want/need to rent. There's another reason as well. The rental industry tends to not have the best reputation in terms of customer service (some of it deserved). Most customers are unaware of who owns who in the industry. Say for example, a customer has a terrible experience with Dollar and swears never to rent from them again. That same customer will have no problem at all renting from Thrifty next time, not realizing that Dollar and Thrifty are basically just two brands of the same company. It can work to the rental company's advantage in some cases. Auto Enthusiast and cestmoi123 like this. Definitely not. I meant a dirt cheap rate at a local airport, as in close to where I live. If I could get a $10/day rate at the airport 30 minutes away for an Emerald Aisle rental I'd do it in a heartbeat, just to have a nicer car to drive for the weekend. But the cheapest I've seen at my local airport is $25-$30/day with airport fees.